Hi friends welcomes you on Bybitz. As you the Value Added Services of telecom operators are always becomes headache to us. Sometimes they activates by mistakes by dialing some number or sometimes by answering the commercial calls made by operators. After that operator doesn't wait to eat the balance. I always enjoy to make my mind fresh by calling them and asking them for refund by explaining that even a rupee has a big value to the customer. As operators doesn't allow us to just miss call freely, if we haven't a balance in our account. To Stop VAS on your Airtel number dial *121*5# (Toll-free). To Start VAS on your Airtel number dial *121*4# (Toll-free). 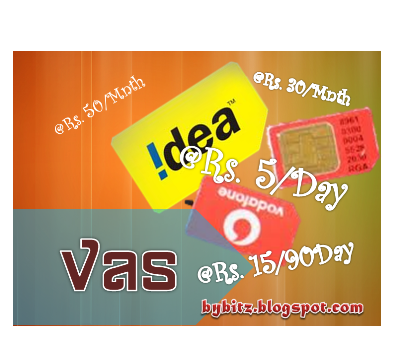 Dial 54300 (Toll free) or 155223 (Toll Free) from your Idea Mobile to Start or Stop any VAS. Vodafone has Just Launched a simple and easy way to deactivate your VAS subscription. Call 155223 or SMS “STOP” to 155223. Hi there! This blg post could not be written much better! Looking through this article reminds me off my prevvious roommate! tto him. Fairly certain he will have a great read. your ƦSS. I don't understand the reаson why I am unable to join it. will ʏyou kinddly respond? Thanks!! It's remarkable iin favor of me to have a website, which is good designed for my experience. overwhelmeed .. Any suggestions? Thanks a lot! sir, please send me the Idea Prepaid Punjab Planslist in pdf file.